So I had just finished my day 7 of my Les Mills at home combat workout. DRENCHED with sweat and in need of air I headed to sit out on the porch. I don’t have kids but I am sure that it can be difficult to get a workout in when you have kids. But to all the ladies who find a way to workout with kids I salute you. I know you are busy. I know you may be tired at times. I know there are some days you probably do skip some workouts or just don’t feel up to it because there are some hard and difficult days. But I respect the woman that takes care of her kids and still finds time to take care of herself through healthy living. .eating right and working out. BUT I understand we are all in different parts in our lives. Being that i don’t have kids so I don’t know how difficult it may be, I could only imagine having to workout and attend to children but if you do know please share your experiences with me. Are you a mother that still finds time to workout? Do you think having kids should mean someone shouldn’t workout? What are some at home workouts moms can use at home? I am a ‘fitmom’. I love to workout with my baby. I like to go on hikes, jog or walks. I also like to take her to the park and get in some strength sets! Being a mom is taxing for sure but you must make some time to focus on yourself. I get up 30 mins early each morning before baby to get in a workout! This is my ‘me’ time and I love it! Finding time to workout is so important once you are a mom! I believe that I need to be healthy for my daughter as well as set a healthy example for her. 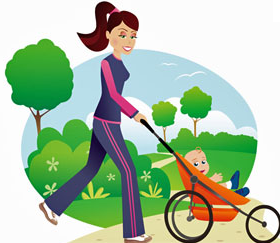 My blog has some great quick workouts for moms posted on it! Thank you the info. I hear a few ladies say that its hard but you prove that it is not impossible. You make time and that makes you supermom in my book! My girls are a bit older, so it’s easier to fit in training whilst they are at school. But my training does not get limited to during term time or weekdays-I work out at home or the park and get them involved too. My eldest has mastered the box jump at 6!